Treasures of all types — yet the hard part is not capturing the ship's bounty, but dividing it fairly among the pirates! 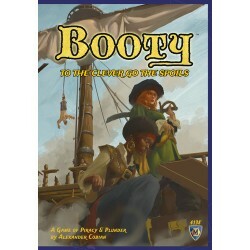 Players take turns splitting each round's booty into shares for the other players. Different types of treasures have different values, and of course there's the hidden items to keep people guessing. Will you be the quartermaster to give everyone their fair share – but giving yourself the best share? Each round in Booty, cards representing treasures are revealed. Some are worth points immediately, some items cancel others, some give you a chance (but not a guarantee) for a big payday. The quartermaster, a job that travels from player to player, divides the treasures into shares and also includes the order of picking treasures in the next round. Balancing what you need, what others might want, and trying to get a little extra into your treasure pile is the key to success! The building cards provide many special benefits that allow for a broad range of strategies every time you play. 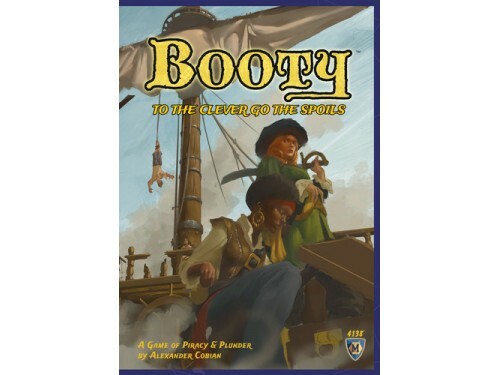 Return to a bustling Plymouth Harbor in 1572 as an aspiring Elizabethan captain making preparations ..
Summary: This is a pirate-themed tactical race game with player interaction and side goals..